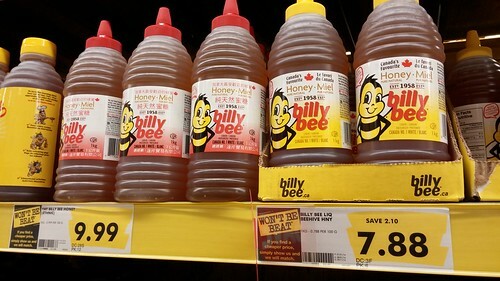 At my local No Frills, they sell two different bottles of Billy Bee liquid honey. These 1kg containers are almost identical, containing the very same honey with only one exception. One is in English and French while the other is in English, French and Chinese. On this day, the honey with Chinese characters on the label will cost you $2.11 more. Go figure. I showed my wife this post. She reminded me that at our local Superstore (also Loblaw), the 24 pack of PC toilet paper is often cheaper than the 12 pack. And we are headed there this evening. Joy. I too bought honey today at a No Frills in South Etobicoke. Didn't notice the ethnic honey in Mimico. Was this in Long Branch? wasn't really honey. I went home and read up on it. Yes, Lake Shore and Browns Line. In this case, one of them is on sale. Whoever programmed the sale probably did it on an item-by-item basis, rather than a whole category. The photo's blurry, but there's different SKUs there... under the 7 is DC something with 2 digits. Under the other one, under the 9, is DC and then 3 digits. Flipping this around, I was at a Loblaws, about a month ago. Long enough after Chinese New Year for anything branded as such to be on sale/clearance. Certainly long enough after that it was just about time to clear out the back room of anything too old. Those same Chinese honey went on sale. I'm going to guess for about $2-$4. Significant, especially if you're running a restaurant or something and need a lot of honey. And some guy was. He was checking out with literally every single container. Two shopping carts packed full. The register read somewhere over $1,000. It required a manager to process the order. So I guess for every 10,000 chinese people who get screwed by not having a sale on their honey, there's one guy who made out like gangbusters. This has got me wondering if there is a significant Asian immigrant population in Long Branch? The TOP Supermarket at Brown's Line/Evans seems to do quite well and it is a great place to pick up Asian food items including all kinds of products with no English or French to be found on the packaging. On a similar note, Mimico has become a landing-place for people from the Philippines. There doesn't seem to be a specific reason for it, other than once some Philippines families moved to the area & bought homes, other Philippines immigrants did too, and rented apartments from the first wave of people. Then those people bought their own homes, and other Phillipines immigrants came over and rented the same apartments. And the cycle just repeats itself. Often major honey producers include Chinese honey even when it says "Made in Canada". Google is your friend on this subject. The best location to buy good honey is a local farmers market or grocery store that sells real Canadian honey. Speaking of Mimico, I had a very nice brunch at the Canadiana in Mimico this afternoon. Has anyone seen the You Tube and Facebook videos demonstrating how much more coffee a Tim's XL gets you over the L? They are alomost the same amount. Yeah, that's a good little spot. Another good breakfast place (in New Toronto) is Lucky Dice which is around 5th I think. It has become our annual Christmas parade tradition: breakfast at Lucky Dice, then roll out to the sidewalk when the parade starts. I always thought it looked like a dive so I never went in, until friends recommended it. Geezus, Thanks Bob. Being a Timmies XL drinker, I've been duped (some would say it isn't that hard).